A DEADLY comet wafting poisonous gas in its trail is heading straight for Earth. The comet, called the Lulin, is set to blast into our solar system near the end of this month. An eerie green light in the sky will be visible to the naked eye as it gets closer to its target, our own planet. Lulin’s green colour comes from the sunlight reflecting off the gases that make up its Jupiter-sized atmosphere. Jets spewing from the comet’s nucleus contain cyanogen, a poisonous gas found in many comets, and diatomic carbon. Experts say it is the first time Lulin has made a beeline for us. But experts reckon Lulin will not actually kill because despite the danger gases, it will still be speeding past earth from a mega 38 million miles away. 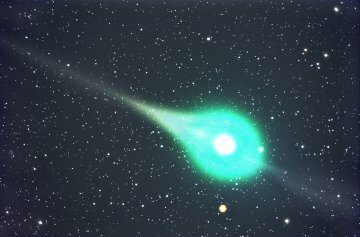 The unusual comet is due to be closest on February 24. Star-gazers should make the most of it because it will not be back for a million years. Now, I do not believe that that Comet N3/Lulin will have a massive impact upon this planet, but the Bible indicates that something from the sky, most probably a comet, will. This entry was posted on Tuesday, February 24th, 2009 at 4:40 am	and is filed under Doctrine.